SUPERBOY: The Unofficial Biography of the Modern Boy of Steel That Uses the Name of Superboy! 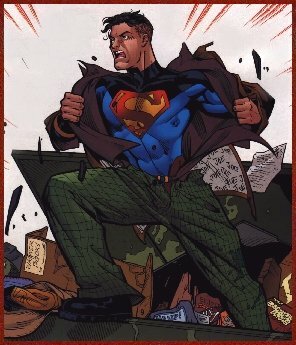 The modern Superboy was created by Karl Kesel and Tom Grummet and first appeared in Adventures of Superman #500. While the Cyborg had Superboy restrained, he told him of his plans to destroy Earth and make it into another Warworld. While the Cyborg and Mongul were elsewhere planning their next move, Superboy panicked and triggered his tactile telekinetic powers, blowing up his restraints. Although exhausted The Kid managed to escape. Knowing that he couldn't take on the bad guys himself and knowing that the JLA were in space he went back to Metropolis to find help. Before long Superboy found himself on tour. After stopping off in Hawaii, The Kid decided to make it home. Along for the ride were Rex, his tough-as-nails daughter, Roxy, and Dubbilex. Not long after arriving in Hawaii, Superboy learned that Tana Moon, the TV reporter who had covered his adventures in Metropolis, was now living in Hawaii as well. The two became something of an on-again-off-again item. In a relatively short time, Superboy had encountered foes including Sidearm, Scavenger, King Shark, Silver Sword, and Copperhead and many others! He'd formed a confusing and dangerously flirtatious relationship with the meta-human called Knockout, who would just as soon kiss him as kill him. He had also formed an alliance with head of the Honolulu S.C.U., Sam Makoa and run afoul of truant officer Mack Harlin, who corralled Superboy into going to school. Although Superboy had to leave his placement tests early, his implanted knowledge caused his test scores to be high enough to be a Sophmore in Ilupani High School. Here he met one of his best friends, Hillary Chang. Later Mack Harlin allowed The Kid to be home schooled by Dubbilex after a fight with Apokolips' Female Furies destroyed his school. The Kid has also earned the trust of heroes throughout the universe and timestream! He was a member of the old JLA, was the leading force of good in an intergalactic/interdimensional rave, he was such an influence that his return inspired the ravers to victory against some evil Khunds, and the Earth clique even named them selves Superboy and the Ravers! He is also an honorary member of the 30th century's Legion of Super-Heroes, was invited to join a team of the Teen Titans, and most recently joined a junior branch of the Justice League called Young Justice. Superboy has managed to survive a deadly clone plague, the meltdown of his genetic structure, fighting a mindless clone of himself, as well as helping save Superman from capital punishment at the hands of the Intergalactic Tribunal, and was a key factor in breaking up the Silicon Dragons, a deadly hi-tech gang of criminals that held Hawaii in a grip of terror. Through all of this, he has learned much, but come out relatively unscathed. The only permanent injury he bears is an inability to age due to the meltdown of his genetic structure, a parting gift from the Agenda when they kidnapped and made an evil clone of him named Match. Therefore he will continue to appear 16 years old for the rest of his life. Until lately Superboy was a very popular public figure in Hawaii. Due to his mis-managed public appearances, and lack of respect to the old Hawaiian legends, he has found his approval rating falling. After his recent visit to the "Wild Lands" he has decided to be a field agent for the newly restructured Cadmus outside of Metropolis. Around the time of Superboy's 2nd birthday, on a trip to Superman's Fortress of Solitude, Kal-El officially adopted Superboy as a cousin, and named him Kon-El. This was one of Superboy's proudest moments. Before this, he never felt he needed a real name, that he was just Superboy. Now he uses the name with great pride. Shortly thereafter, a Superboy died on the table of the JLA, and Superboy was sent through Hypertimelines by the JLA to defeat the villain Black Zero from destroying every timeline of the universe. During this trip through Hypertime, Kon-El found out that Clark Kent was Superman when he teamed up with an alternate Kal-El who was Superboy at the age of 13. Superboy�s powers are connected to the experiments involving Superman�s aura that were an important factor in his creation. The scientists at Cadmus were able to translate that aura into a telekinetic field which gives Superboy the power of tactile telekinesis, a power that can simulate most of Superman�s powers. Tactile telekinesis makes Superboy capable of doing a wide variety of things, but it seems he barely understands how to use these powers beyond their basics. It is possible they were on the verge of teaching him what he can really do with his abilities, when he prematurely escaped Cadmus. Tactile telekinesis is pretty much an energy field that surrounds Superboy�s body much like Superman's. The difference though is that this is his only power. The theory now is that if he can picture moving it with his mind, and he can touch it, it will be done. This enables him the equivalent of super strength, practical invulnerability, and the ability to fly. As of yet, he doesn't know how to deflect energy, and gets hurt a lot easier by energy form attacks than by solids. He does keep improving though. Recently, he's learned he can extend his field under water, allowing him to move liquids. As time progresses, he's learning to develop an invulnerability to energy attacks, and can withstand much more than he used to. Recently, he and Green Lantern were thrown into molten lava, and he was able to both save both of them and walk away from it virtually unscathed. In regards to strength, Superboy can do a lot of the same things Superman can. About the heaviest thing he's lifted so far was the world's largest yacht. He has also prevented a train from crashing into another train. Although this would rate him among the strongest heroes on Earth it can�t really be counted as true super-strength. Once he was bound up with chains that was surrounded by a force field, and since he can't yet manipulate energy, he was virtually helpless and unable to free himself. It is known that at least for now, he can get hurt by energy, but most forms can't kill him. This is mainly due to the fact that he seems to resist energy attacks better than a normal person can, and is getting better at resistance. Tactile telekinesis seems to affect his metabolism as well. Superboy has a super-healing factor which means that if he ever gets hurt he heals really fast, and a lot faster than a normal human being would. This in part has probably helped him survive nuclear annihilation, recovering from diseases that would kill normal humans, and the ability to get up after getting smacked around by super-strong types such as Valor and Knockout. When unconscious, Superboy's telekinetic field drops, and he can get hurt like any normal human. Having a "super-metabolism" can also mean that under stressful conditions, Superboy's reflexes get lightning fast. He has stopped bullets in mid air, and has met fist with fist against Valor. However, he does not by definition have super-speed. Under normal conditions, if he and Robin had a race, Superboy would win quite easily. However, he once raced Impulse (he flew while Impulse ran), and got beaten quite badly. When flying, he is much faster, but still isn't considered to be super-speed. At top speed, he can outrun a high speed train, or fly coast to coast in under 4 hours, and has outflown a jet flying at Mach 3. Since Superboy can't touch gases, he gets as easily hurt by them as any normal human would. He has been hit with knockout gases before and has never fared too well. Superboy has also gotten a little more creative with his powers and has learned to manipulate the ground to cause explosions through sheer will power. Of course he must be touching the ground to do this. With the exception of Kryptonite and magic none of Superboy's weaknesses are a given. For a time Superboy wore a eye-visor made by professor Emil Hammilton that gave him Infared Vision, Microscopic Vision, Telescopic Vision, X-Ray Vision, and Heat Vision. This weapon was lost, then used against The Kid, so he destroyed them to prevent anyone from getting hurt if they were ever taken by a villain again. However, since then the Scavenger has picked up the remnants of them, and has them hidden away in one of his many secret bases. Recently, Serling Roquette, a geneticist at Cadmus, has found that as Superboy ages, he will gain more powers like his clone Match has already. These include vision and aural powers. Although no one is sure exactly which powers he will recieve, in a vision of his future shown by a future Superman, he say his fellow members of Young Justice yelling for him to use his heat vision. This page is part of the Unofficial Superboy Website. If you are currently visiting the Unofficial DC Guide but wish to go to the Unofficial Superboy Website, just click here and the it will open in a new browser window. If you are currently visiting the Superboy Website: click here to go to Main page. This page is also cataloged in the Unofficial Guide to the DC Universe and appears courtesy of the Unofficial Superboy Website. If you are currently visiting the Unofficial Superboy Website but wish to go to the Guide, just click here and the Unofficial DC Guide opens in a new browser window. If you are currently visiting the DC Guide: click here to go to the Who�s Who Main page. This bio look familiar? It should. EXTRA EXTRA special thanks to Nik Stanoshek for allowing me to steal his Superboy bio for use on this page! All Characters featured on this page and all titles of books herein, as well as all images containing DC Comics characters are TM and � of DC Comics, unless otherwise stated. All text copyright� Nik Stanosheck 1997-1999. This page and all herein may not be used by others without the express and written consent of the owner of this site.